House Joint Resolution 75 is passed by the House and sent to the Senate where it is referred to the Committee on Foreign Relations. It is not as strongly worded as the initial draft (see December 4, 2001), which included a provision stating that the refusal to admit inspectors would constitute an “act of aggression against the United States.” The final version instead reads: “Iraq’s refusal to allow United Nations weapons inspectors immediate, unconditional, and unrestricted access to facilities and documents covered by United Nations Security Council Resolution 687 and other relevant resolutions presents a mounting threat to the United States, its friends and allies, and international peace and security.” The bill is sponsored by Representatives Lindsey Graham (R-SC), Porter Goss (R-FL) and Henry Hyde (R-IL). [Library of Congress, 1/15/2006] This bill will die in the Senate. The congressional bill that conditionally authorizes Bush to take military action against Iraq is not passed until October 11, 2002 (see October 8 and 11, 2002). Senators Lindsey Graham (R-SC) and Jon Kyl (R-AZ) file an amicus curiae brief with the Supreme Court in the case of Hamdan v. Rumsfeld (see June 30, 2006) saying that because of the passage of the Detainee Treatment Act (DTA—see December 15, 2005), the Court no longer has jurisdiction over the case. Graham and Kyl argue their point by citing the “legislative history” of the DTA, in particular the official statements Graham and Kyl made during debate over the bill, and specifically an “extensive colloquy” between the two that appears in the Congressional Record for December 21, 2005. Graham and Kyl argue that this “colloquy,” which argues that Guantanamo prisoners have no rights under the standard of habeas corpus, stands as evidence that “Congress was aware” that the DTA would strip the Court of jurisdiction over cases that involve Guantanamo detainees. (The Senate included an amendment written by Graham, Kyl, and Carl Levin (D-MI) to the DTA that would reject habeas claims in future court cases, but does not apply retroactively to cases already filed, such as Hamdan.) However, Graham and Kyl never engaged in such a discussion on the floor of the Senate. Instead, they had the text inserted in the Record just before the law passed (see December 30, 2005), meaning that no one in Congress heard their discussion. The brief indicates that the discussion happened during the debate over the bill when it did not. The Record indicates that the discussion that did take place concerning the Hamdan case comes from Democrats, and explicitly state that the DTA has no bearing on the case. C-SPAN video coverage of the debate proves that Graham and Kyl never made those statements, and Senate officials confirm that the discussion was inserted later into the Record. But in their brief, Graham and Kyl state that “the Congressional Record is presumed to reflect live debate except when the statements therein are followed by a bullet… or are underlined.” The Record shows no such formatting, therefore, says the brief, it must have been live. The debate between Graham and Kyl is even written to make it appear as if it had taken place live, with Graham and Kyl answering each other’s questions, Kyl noting that he is nearing the end of his allotted time, and another senator, Sam Brownback (R-KS) apparently attempting to interject a question. Lawyers for the prosecution will strenuously object to the brief, and Justice Department defense lawyers will use the brief as a centerpiece for their argument that the Supreme Court should throw the case out. [US Supreme Court, 2/2006 ; Slate, 3/27/2006; FindLaw, 7/5/2006] Former Nixon White House counsel John Dean will call the brief “a blatant scam,” and will accuse Graham and Kyl of “misle[ading] their Senate colleagues, but also sham[ing] their high offices by trying to deliberately mislead the US Supreme Court.… I have not seen so blatant a ploy, or abuse of power, since Nixon’s reign.… [Graham and Kyl] brazenly attempted to hoodwink the Court regarding the actions of Congress in adopting the DTA.” [FindLaw, 7/5/2006] Their efforts will not be successful, as the Supreme Court will ultimately rule against the Republican position in Hamdan vs. Rumsfeld (see June 30, 2006). Advocating Continued Detentions without Trials - In an interview with Fox News, Vitter goes further than his Senatorial colleagues, saying that he favors continuing to detain some suspects without trials. “We need the ability to deal with these folks adequately,” he says. “To me, that has to include the ability to detain some—without trial—to continue proper interrogation.… I’d like to have Gitmo stay open. 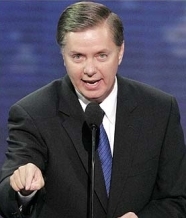 But certainly, we need detention facilities where we can detain dangerous terrorists without trial, continue to interrogate them.” [Think Progress, 1/30/2009] Fellow Republican Senator Lindsey Graham (R-SC) has already made the same recommendation (see January 21, 2009). Many top US military commanders in the Middle East are distressed at Senate Republicans’ efforts to block Christopher Hill’s attempt to become the next US ambassador to Iraq. Hill, who was largely successful in crafting a nuclear non-proliferation agreement with North Korea (see Spring and Summer 2005 and February 8, 2007 and After), is being blocked by the efforts of Senators John McCain (R-AZ), Sam Brownback (R-KS), and Lindsey Graham (R-SC). Two days after staunchly defending waterboarding as an interrogation tactic (see April 20, 2009), Senator Joseph Lieberman (I-CT) now claims he has always “strongly opposed” waterboarding. Lieberman, joined by Senators John McCain (R-AZ) and Lindsey Graham (R-SC), writes: “We have… strongly opposed the overly coercive interrogation techniques, including waterboarding, that these [recently released Justice Department] memos (see April 16, 2009) deemed legal. We do not believe, however, that legal analysis should be criminalized, as proposals to prosecute government lawyers suggest.” [US Senate, 4/22/2009] The same day Lieberman defended the use of waterboarding, McCain, who has always opposed torture as an interrogation method, spoke out again against the practice (see April 20, 2009). 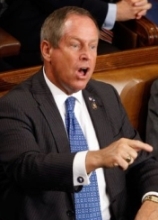 June 3-4, 2009: Republicans Dialing Back Inflammatory Rhetoric towards Supreme Court Nominee? Armed Man Attempted to Get to Capitol before Speech - Shortly before Obama’s speech, Capitol Police arrested a man trying to enter the Capitol grounds with a shotgun and a rifle (see September 9, 2009).